It doesn't feel like the weekend is over since I'm off till January 3. Yay for being able to just hang out and watch terrible Netflix instant movies for a week : ) Although they have put a bunch of Disney movies online so I'll probably be watching those. This weekend was lovely. Friday night Kevin and I went into the city for a surprise birthday get together for our good friend Kelli. She was so surprised she almost started crying, thought everyone was out of town and ditching her on her birthday ha. I totally brought my camera to take more pictures but I failed! Pulled this one from Kelli's facebook. Saturday Kevin and I headed down south to Peoria, IL. 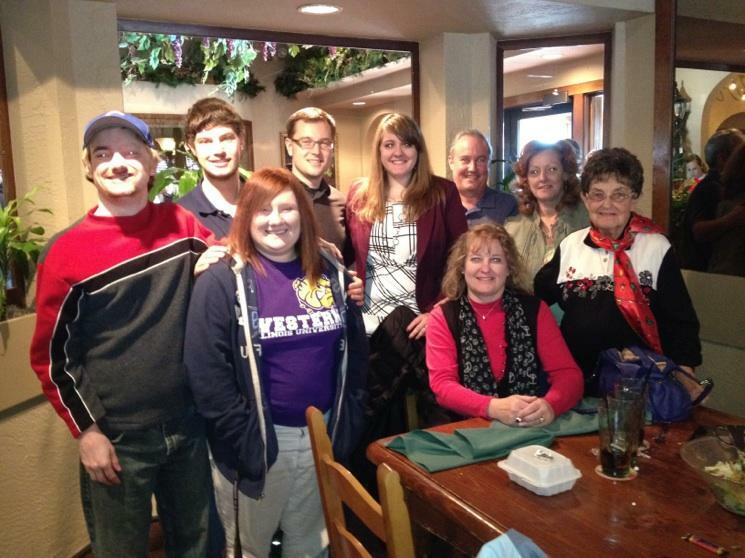 We met up with Kevin's brother and his wife along with Kevin's aunt, cousin and his grandma for lunch. It was really nice to see and catch up with his grandma and aunt since neither were able to make it to our wedding. Here is a group photo of everyone. Not the best but it was taken with an older cell phone camera. Sunday was a nice casual day for me. Kevin was off doing bass stuff for the afternoon and I was finishing up a present that I thought we had but didn't! Luckily I think quick on my feet. Here is the Pinterest version I found. My version! 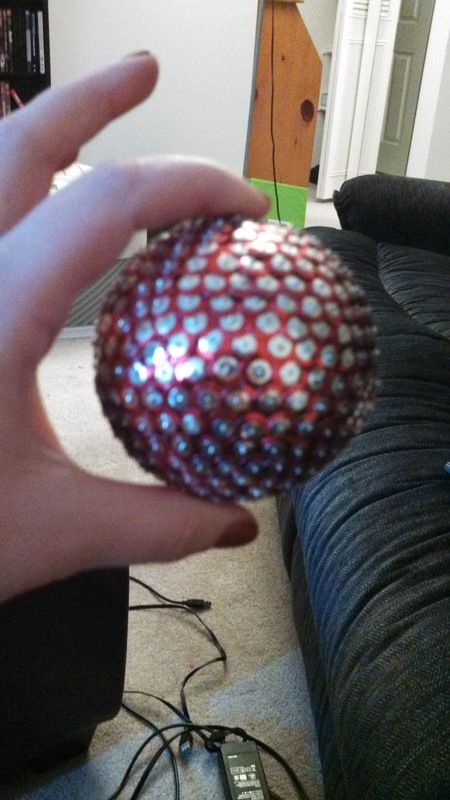 I had a bunch of extras so I'm making an all red one too. I got about 4 in then a cd got stuck in my computer so I took it to my brother to hopefully fix. Since that has all my new coverletters and resume I kinda screwed myself on that one! I just full out failed on this one. I actually ended up just working on organizing my files in general but I'm still going to count it! I didn't write about our wedding but I did write a couple of posts for a special week long segment I'm going to do later! Check back later this week cause I think I figured out this whole rafflecopter thing and I'll be doing a giveaway to celebrate 100 plus followers!!! Hope you all had a great weekend and will have a lovely holiday. Love the new layout! I'm glad your weekend went well. Hope you have a wonderful Christmas! Keep plugging away with the job applications. I know that can be overwhelming. I am stopping by from the link up. Congrats on the over hundred followers! How exciting. So glad that you've linked up with us again this week! Good luck with your goals for the week ahead- I know you can do it! I'm SO LOVING your new layout, too! AND you're already up to 124 followers- I LOVE IT!